Prodori announced today the release of the brand new Raphael Leon Classic II. The Classic II is currently available at Prodori’s Amazon store. 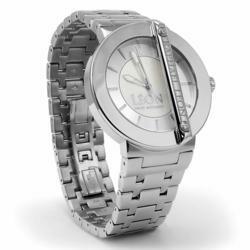 The design of the Classic II maintains the distinct Raphael Leon styling, with two diamonds set into an accent bar on the front of the watch, and a Mother of Pearl dial. Prodori announced today the release of the brand new Raphael Leon Classic II. The Classic II features the boldly simple design that Raphael Leon has come to be known for, including the famous two-diamond accent bar. The Classic II is currently available at Prodori’s Amazon store, and other electronic retailers. With Prodori’s traditionally small production runs, the available inventory may sellout quickly. The Classic II is an update to Prodori’s Raphael Leon Classic luxury watch. A Swiss movement powers the Classic II men’s watch. The design of the Classic II maintains the distinct Raphael Leon styling, with two diamonds set into an accent bar on the front of the watch, and a Mother of Pearl dial. Available in many different colors, including white gold, yellow gold, and rose gold, Prodori encourages consumers to search through all the color options to find the perfect Classic II to complement their style. The mission of Prodori is to help people express their individuality through fashion, with products that blend tradition with innovation, and culture with creativity. Prodori strives to engineer and design products that make people feel unique, special, and break free of the monotony of traditional fashion markets. Prodori brands each have their own unique style, the bold simplicity of Raphael Leon, the artistic fluidity of Akimio, or the outrageous fun of LoLo & Co, Prodori brands provide the consumer with an opportunity to express themselves through fashion.